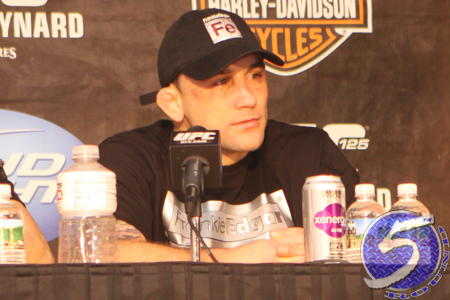 Frankie Edgar (pictured) agrees with the 53 percent who voted that he should get next crack at reigning UFC featherweight king Jose Aldo, despite the fact he lost to Aldo just 22 months ago. “The numbers don’t lie. I do it with my fighting not my talking,” Edgar wrote on his verified Twitter account with an image of the poll results from UFC.com. The second sentence in Edgar’s post is referencing the chatty Conor McGregor, who “The Answer” was up against in the ballot. McGregor captured 47 percent of the votes. Although McGregor has a fight on January 18 against Dennis Siver that he needs to focus on, where a win could very well earn him a shot at Aldo, he took the time to address Edgar and the fans who voted against him. McGregor Vs Poirier $2.2 million. Conor bless,” McGregor responded to Edgar on Twitter. McGregor is referencing the live gate numbers of he and Edgar’s last fights. McGregor headlined UFC Fight Night 46 against Diego Brandao in his homeland of Ireland, which garnered $1.4 million at the door. “Notorious” then received third-to-top billing at UFC 178 for his showdown with Dustin Poirier, although the featherweight affair received the most attention on the card. The September show took place at MGM Grand Garden Arena in Las Vegas and made $2.2 at the gate. Edgar is nine days removed from his submission victory over Cub Swanson at UFC Fight Night 57. That event went down inside Frank Erwin Center in Austin, Texas and only made a live gate of $670,022. McGregor’s number was off by $30k, but his point was made. McGregor can make a bigger point by unleashing a highlight reel finish over Siver.